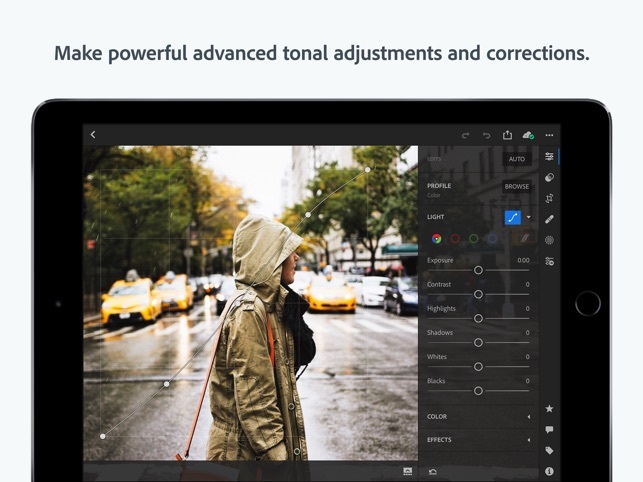 Adobe Photoshop Lightroom CC is a free, powerful, yet intuitive photo editor. Lightroom also provides a robust premium offering filled with advanced features to take your photography further. Check out all the features below. 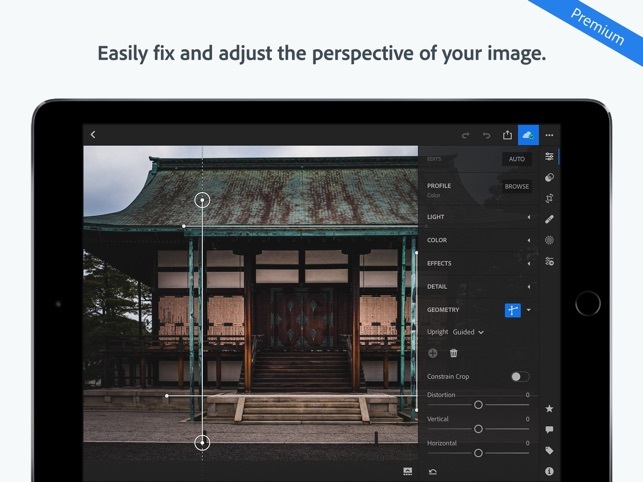 Take your photography to the next level with Lightroom Premium! 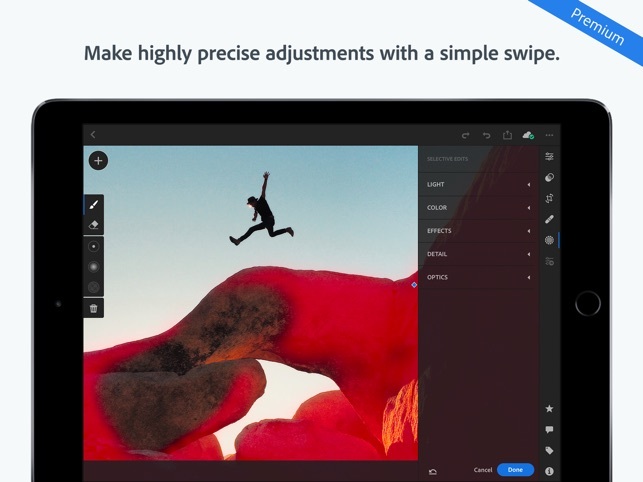 Upgrade to unlock easy-to-use tools like the Healing Brush, selective adjustments, geometry, cloud storage, Adobe Sensei, and more. The recurring monthly payment is automatically charged to your iTunes account. To stop service, go to account Settings and turn off auto-renew at least 24-hours before the end of your billing period. Prorating is unavailable — when you turn off auto-renew, service will continue until the end of that month’s billing period. Use of Adobe mobile apps and online services requires registration for a free Adobe ID as part of a free Creative Cloud membership. Adobe online services require an Internet connection, are not available in all countries or languages, and may be subject to change or discontinuation without notice. 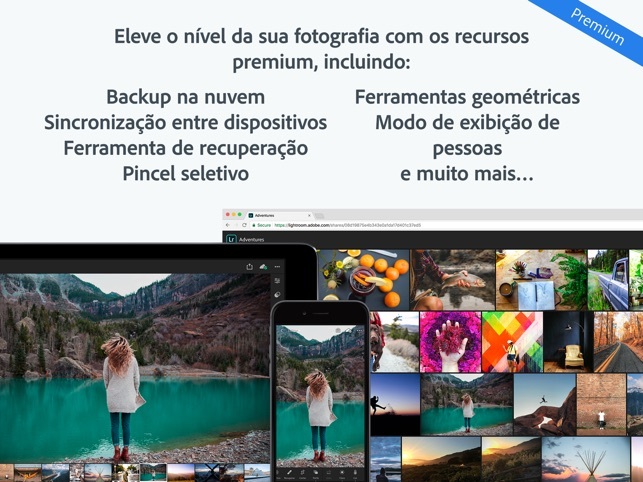 • [Premium] Ad-hoc Photo Shares: We’ve introduced the ability to create ad-hoc collections of shared images. Select a few photos, tap share, and select Share to Web. 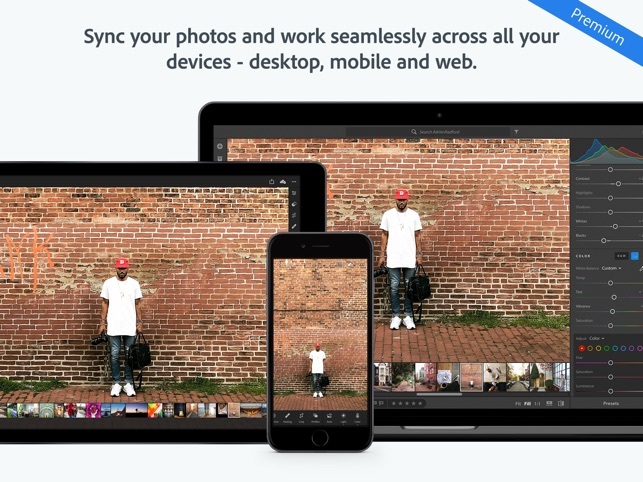 Your photos will be added to a webpage that give you control over whether or not viewers can download photos, add comments, see camera settings, or where the photo was taken. 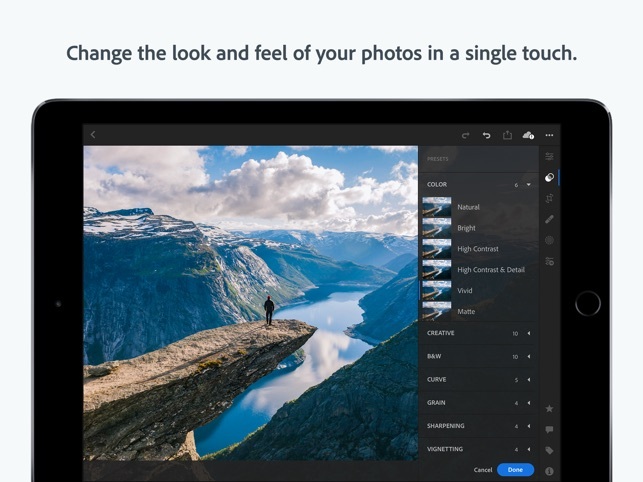 • New Lightroom CC Share Extension: Now in addition to the Copy to Lightroom CC iOS Share Extension, a new Lightroom CC Share Extension has been added. 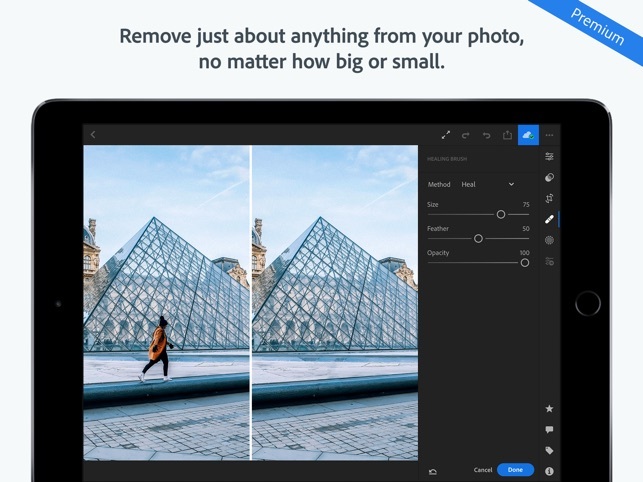 The new Lightroom CC Share Extension enables you to easily send multiple photos from other apps directly to Lightroom. • ACR Integration: Support for latest cameras and lenses found in the Adobe Camera Raw 11.2.1 release (the full list of supported cameras and lenses can be found at http://www.adobe.com/go/supported_cameras). 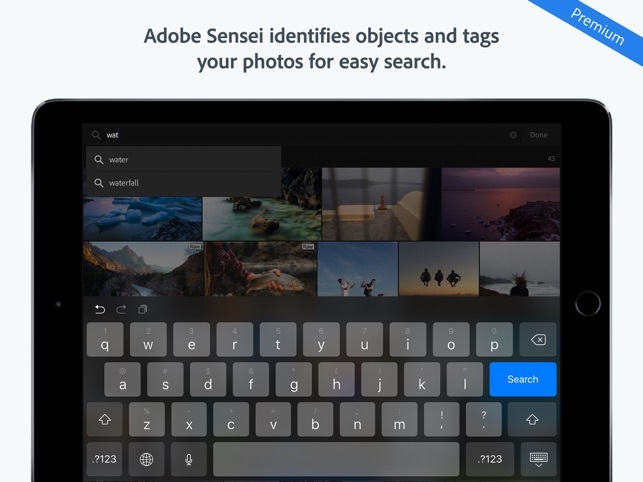 • Lightroom CC for Apple TV is now bundled with Lightroom CC for iPhone, making it even easier to view your favorite photos on your TV. 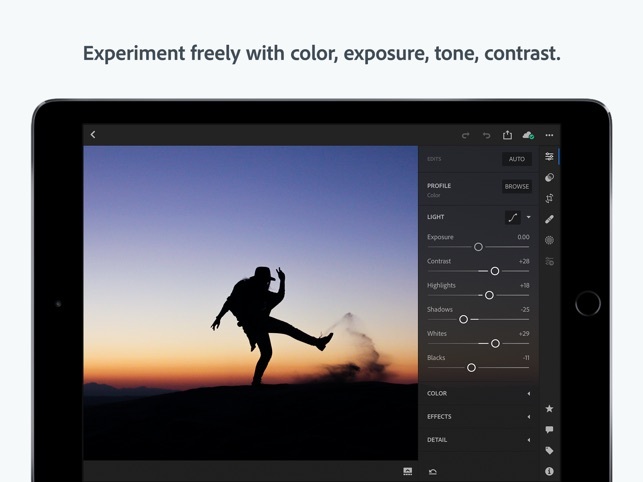 • All presets are now shown by default, with an option to hide those presets that contain some enhancements not available for the current photo. A new “show partially compatible presets” option has been added to the three-dot presets menu. • Additional user interface refinements, bug fixes, and optimizations. I downloaded Lightroom mobile as I’m really wanting to move away from desktop and laptop editing, and LR Mobile seemed promising. I LOVE the UI and functionality of this app, and can do about 95% of the work I need to right from my iPad Pro, and I was actually a bit blown away by its speed and capabilities. Then I went to export about 100 photos I had taken with my Panasonic G9 and edited in Lightroom Mobile. I thought the iPad was glitching, or I had toggled a setting that I didn’t know about, because I wasn’t able to export more than 15 photos at a time. After doing a bit of digging I’ve found that this is done on purpose. The reason being that Lightroom isn’t able to render in the background, but that doesn’t make any sense as I’m sure we’re all more than willing to leave the app open and running in the foreground until the export is complete. This is a preposterous number of images to export at one time. Give us at least 100 images, as we could work with that limitation; but only 15? That quite literally renders this entire app, and all the hard work these developers put into it, totally useless. A 5 star app turned to a 1 star app due to a major oversight. I’ll most likely be looking for ways of leaving Adobe after about 15 years of exclusively using their products, if they don’t get their $#!+ together asap. FIX THIS RIDICULOUS LIMITATION ADOBE, PLEASE! This is a fine editor for photos on the iPad, in fact I liked it enough that I thought I might try working on my pro camera raw photos via Adobe Cloud while traveling. However, my Adobe Cloud account (arranged by my employer) only has 2GB max, which is very limited. When this LR CC mobile app prompted me to buy the Premium version, offering additional Adobe Cloud storage, I jumped on it. But after trying it out, I found that my Adobe Cloud storage was still capped at 2GB. Trying to get help, I was diverted to unrelated Adobe help forum topics. And when I tried to talk to Adobe directly, they told me I had to go through my employer...even through this premium upgrade was a purchase I made out of my own pocket, under the stated promise that it would include additional cloud storage. I feel like I was ripped off, and I would demand my money back but my time is more valuable than the amount I paid. I guess I will just have to find another solution, but there aren’t many options. The market is dominated by a few mega-corporations who don’t care about serving their customers, they do everything they can to prevent us from getting help when needed, and they always err on the side of denying us the product we thought we were entitled to when making the purchase. The interface is great and operates smoothly and the processing is as good as the desktop version. Unfortunately, there are a few basic problems that make the product borderline unusable for pros. 1. Sorting by capture time is broken because it doesn’t go to the millisecond. Therefore, if you shoot at more than one frame per second (eg. sports, action, kids, weddings), your photos will be out of order. 2. There does not seem to be a way to batch apply a preset to multiple photos. You instead have to select the preset on one of them and then paste it onto each photo individually. 3. No ability to make a virtual copy or easily duplicate a photo. 4. This is the biggie that is the number one thing keeping this from being a professional tool. You can’t batch rename photos either on import or export or any other time. Like all professionals, and I’m sure many amateurs, I rename files with the date, subject, and a sequential counter so that they can be identified easily and don’t look like I just copied them straight from my camera. I hope that everyone that reads this tells Adobe they need to add this feature! Requires iOS 11.0 or later. Compatible with iPad.